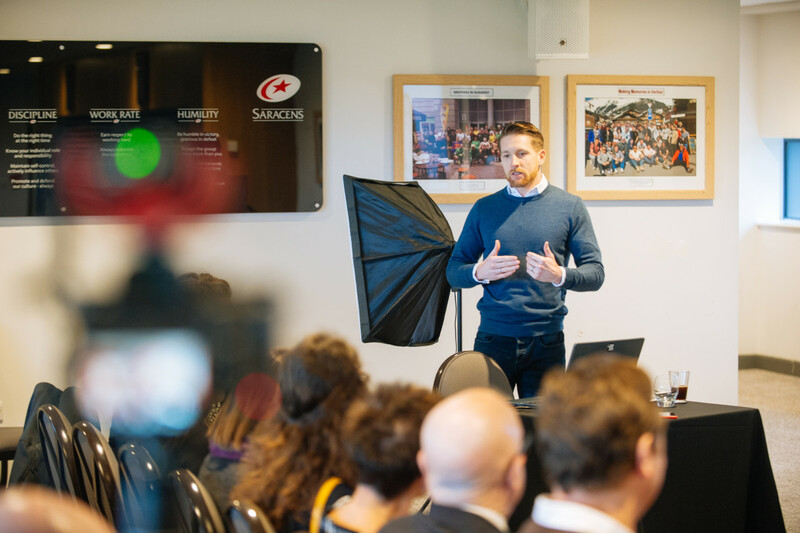 The recent Event Planners Talk took place on 21 February at Allianz Park in London. It was entitled ‘Pitching for Success: Pitfalls and Opportunities’. We welcomed an esteemed panel of leading business leaders specialising in corporate events: Kevin Jackson, founder of The Experience is the Marketing, Scott Seaman Digby Collins, Group CEO at Hawtrey Dene Group, Craig Pugh, Proposal Response Manager at DRP Group and Angie Mason, Chairman at Absolute Corporate Events. The discussion was moderated by Caleb Parker, Future in 15 Show host. This panel discussion was a follow-up on a previous Q & A with Kevin Jackson, focusing on whether agencies should charge for pitching and why building a relationship is a more effective alternative to the often-uncertain pitching process. The discussion offered multiple perspectives from both agency and compliance sides on the issue of charging for pitches, and ultimately why that wouldn’t become an industry standard. According to Angie, there should not be a charge for pitching. It doesn’t matter in what business you are in, there will always be a cost associated with gaining a new piece of business, and only if you have a product or service clients want will they subsequently buy it. According to Craig, it’s also ‘no.’ Throughout his career, it hasn’t occurred to him that they’ve charged for pitching because it is rather difficult to argue the case forward. In contrast, they turn down pitches ‘When you start seeing many pitches coming in without particular opportunity you have to be very careful moving forward.’ Whatever business you have, you will have to cost your sales. Kevin added that ‘Most people put this cost to advertising. Those who don’t advertise, their cost of sales is pitching. We just spend what we need, and that can be any amount. Hence, you have to say ‘no’ to pitching because you can’t pitch most of the time.’ Kevin has mentioned to clients in the past that ‘I can’t afford to pitch; give me the work I’ll do it but I’m not going to pitch for it.’ That provides a way of handing this situation as well. But should clients be paying for pitches? There is an argument for ‘yes’, in the case of the more expensive elements of the services which include creative or strategic elements. An agency can argue that the creative and strategic work that goes into the pitch sets a blueprint for an event you are looking to deliver and is the most costly part of an agency’s services/ business. On the other hand, for the more ‘off-the-shelf’ pricing exercises, the lower end of logistics, it is more difficult to develop an appropriate price tag. According to Angie, you can distinguish the two and separate them but in reality it’s very difficult to make this argument to the client and convince them that they should be paying for it, ‘If you are going to pitch for a certain event that should be assumed that you’ve got the capabilities to be able to deliver that event. So, if you’ve got your production and creative inside your agency then it’s there and a resource you can use. If you are going to outsource all of that then it’s where the cost is going to come in and eat all your margin because you haven’t got an in-house resource.’ From Scott’s experience, there are clients coming forward and putting money towards the pitch, but often that is to cover travel costs. Pitching may involve an investment of approximately 10,000–15,000 GBP to prepare a comprehensive tender pack and is also associated with significant time inputs. Building relationship is more effective than tendering. The challenge with a tender occurs because suppliers tend to be very bad at being suppliers. They come unprepared to meetings, they don’t know what you are asking for and how to manage or handle a procurement person and stakeholders. They don’t come with information, they don’t offer innovation, they don’t do all the things that suppliers should do. Because people are busy and inherently lazy, people would rather build relationships over tendering. The entire tendering process takes a great deal of time, is complex and there is a cost attached to changing a supplier. If you are invited to pitch, there is a tick-list of things you should ask because you should be sufficiently proud of your business to ask these things. Questions include: Can you meet the shareholders? Are there other incumbents in the process? Can I obtain budget information? If the client says no, you should definitely walk away. For example, a client of Scott is covering travel costs of four agencies to see their current conference, learn about what they are doing and build a relationship. In contrast, sending a 10-page document to people you’ve never met is a completely pointless exercise. Even if the price is good — it doesn’t mean anything because it can’t be sustained. Always push back and ensure that your list of concerns is addressed before pitching. If they say ‘no’, you should walk away. Scott added that those on the other side of the table are people too and up for a rational conversation about you adding value to their business. If you find a way to do this, you will win without pitching. The key for procurement is that their clients are getting value for the money they are spending and the outcome they want to achieve. Clients also need to be educated. Clients often think that agencies should be coming to them because they want their business. That is true, but they should also be a client of choice for the agency because their suppliers have other suppliers, and if they are a client in the lower end of their business, they might get serviced but not receive the kind of attention and innovation a business needs. To build a proper relationship, you have to be the client of choice. Suppliers need to make profit as well, and procurement works on the supplier chain as much as they work with their clients, teaching suppliers to be better suppliers. For DRP Group, broadly speaking, approximately 60 percent is generated from existing accounts and relationships and 40 percent from sales-generated situations. Angie’s agency tries to avoid pitching, but they will pitch when they have an existing relationship with the client and, usually, that’s on the incentive side. Both agencies have a lot of repeat business and attempt to evolve what they already have. If you say ‘no’ to a request for proposal or information (RFP/ RFI), would that client never come to you again? According to Kevin, the client doesn’t even notice. When you turn down a pitch because you are too busy to pitch, say you would love to build a relationship instead. Typically, you would get a meeting because everyone understands that you can be too busy to take a pitch when 60–70 percent of your revenue comes from repeat business. But of course, don’t be known for someone who doesn’t do pitches and tenders. Don’t publicise it as a policy. Always say why for a specific tender. Become famous for doing the things you do, and clients will come to you. People buy from people they know; you’ve got to be good and demonstrate it through relationships and knowledge. The client must know that you are available for them, so if an RFP comes through, pick up the phone and say ‘listen, I’m too busy but can we arrange a meeting’ — you get a meeting and no one else does. Where do you stand when you are the existing incumbent and need to re-pitch? Kevin sees it as an opportunity rather than being negative and had similar cases in the past. In that case, he told the client ‘yes we have to pitch, and what we are we going to do? Because we know you, we are going to provide a new creative team at our cost, against our incumbent creative team — so we are going to give you two viewpoints of the job we are doing.’ It shows that you are willing to invest in this business. It demonstrates that you are interested in the thinking and it also shows that you care, that you want a relationship. Knowing what you know about the business after a certain time period of working together, you can beat anyone on price because you know where the money is and the client understands you, so you are 80 percent there. But you can also go the extra mile and put another team on it, so the client gets the best of two worlds — then you are going to win. Why is it that advertising agencies are obtaining long-term contracts and why is the events industry mistrusted? Why do event agencies need to pitch for even the smallest activities? For example, it’s difficult for an event agency to obtain a contract for more than a project because that contract will remove some of the risks entering a pitch. Kevin suggested to ask the client why and suggest working on a retainer basis. In any mature industry, clients are looking to reduce the number of suppliers. The multi-year contracts are out there, you just have to ask, and you’ve got to make your intentions known. According to Kevin, we try to make creative a line item but it’s a lost item because it takes more than that to make a great creative idea work. That’s one of the benefits of moving to a multi-year contract. What you want is the ability to think around a problem. Clients should understand that if they pay for a long-term contract, they will receive a dedicated resource. But you also have to let clients understand what the creative is. For example, Kevin used to bring the client to see the offices and the various departments: creative, technical, logistics — so they understand. Until clients see and meet the people working on their pitch, they don’t have an idea about the scope of the operation. The world has indeed changed — pitching is over 15 years old — it was there for a different purpose to show creative ideas; now it has a larger spectrum involving cost, production, logistics etc. It wasn’t invented for that. Now we can do different things. The world of work has changed, the way we think has changed. There are different ways of building relationships that don’t involve spending thousands of pounds pitching for work. We as an industry have been soft in our requirements — clients don’t know the benefits of multi-year/multi-show events. If you can demonstrate the benefits, then of course they will do it — Why wouldn’t they? Clients ask for outside-the-box thinking but then they ask you for the box they want you to think in. ‘Content is king, context is queen and she wears the trousers’ — It is important to understand the context of a client’s questions, and what they are asking for when they want out-of-the-box thinking. Where are they on the journey? You must find the process that allows you to define what clients are asking for. For example, a way of doing it is by giving client a solution that they can work out how to evolve, instead of offering multiple price categories. How do you ensure that the clients and procurement are educated on event deliverables? Clients do not always get the brief right. Most important is to have a relationship in place, understand their needs and what they want to fulfil. Perhaps it’s not even an event which is the answer, but instead an online solution? So, you need to understand the needs and work backwards. And what advice would you give to clients who want to take a new piece of business to the market? Kevin used to offer to write the brief with the client together and design a brief that will get the best out of everyone.